Posted September 16, 2014 by Heather Michet & filed under DIY, Food, Recipes. Let’s clear something up right off the bat: oats are naturally gluten-free. They become non-gluten-free when they are processed in facilities that mill other gluten-containing grains such as wheat, barley or rye. If you must eat gluten-free, choose certified gluten-free oats for making oatmeal, using in recipes and for flour. These have been processed without risk of contamination (infiltration of gluten from other grains). Making your own oat flour is a cinch. All you need are oats (rolled or whole groats) and a blender, regular or high-speed such as a Blend-tec or Vita-mix. Technique: Put 1 cup of grain in blender container and whiz up until all grains have been turned to powder. In a regular blender, you may need to stir up the flour from the bottom of the container midway through the process so that all grains get down in the blades and pulverized. Store in a glass jar in the refrigerator. 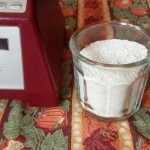 That’s it, your own home ground oat flour.